A VMware vCloud Director (vCD) cluster contains one or more vCD servers, these servers are referred to as “Cells” and form the basis of the VMware cloud. A cloud can be formed of multiple cells. This diagram is a good representation of the vCD Cluster concept. each host must mount the shared transfer server storage at $VCLOUD_HOME/data/transfer, this is typically located in /opt/vmware/cloud-director/data/transfer. This shared storage could be a NFS mount, mounted to all participating servers with rw access for root. It is important that prior to configuring the first server, a decision must be made on whether a cluster is required. If you intend to use a vCD Cluster, configure the shared transfer server storage before executing the vCD installer. 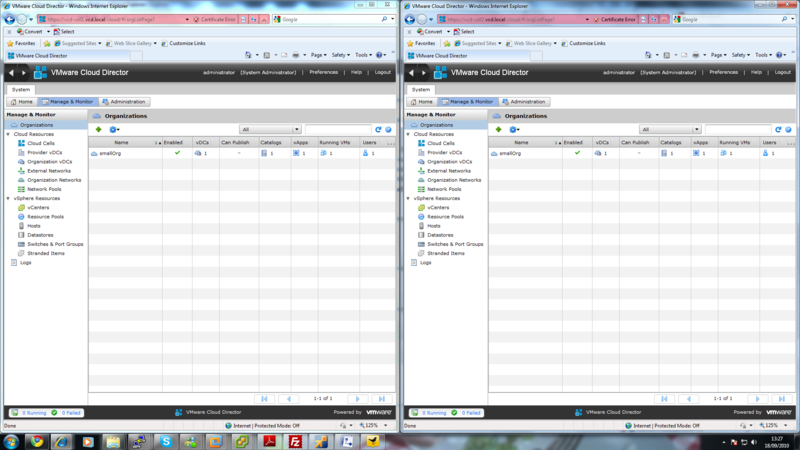 Check out the vCloud Director Installation and Configuration Guide for pre-requisites. For this post, I’ve setup an NFS volume on Freenas and given rw permissions for all cluster members to the volume. It is assummed that you have a completely clean installation of RHEL 5 x64 (or if like me you are running this in a lab CENTOS 5 x64), with all the latest updates and pre-requisite packages. Now you are ready to install vCD onto the first host, making sure that you have met all the pre-requisites as detailed in the vCloud Director Installation and Configuration Guide. Once completed you should have a working cell with its shared transfer server storage folder located on the NFS volume. It is important to note that the response file contains values that were used for the first server. Subsequent servers will use the response file, and as such if you stored your certificates.ks file for the first server in a location not recognised by subsequent servers, you will be prompted by the installation script to enter the correct path to the certificates.ks file for any subsequent servers. To avoid this, you could create all the certificates.ks files for all cluster members and place them in the shared transfer server storage, with of course unique names such as vcd-cell1-certificates.ks and vcd-cell2-certificates.ks. The installer will automatically complete most prompts for you, but you will still need to select the correct eth adapter for the http and consoleproxy services, everything else will be automatic. Go ahead and have a play and maybe even deploy a load balancer on top. Here’s a screenshot of my two cells working side by side connecting to the same shared transfer server storage, oracle database and managing the same vCenters. For more information read the overview at Yellow Bricks which also includes links to the product pages.